If Your LGBTQIA+ Pride Event Isn’t Accessible to Disabled People, You’re Missing Out. Recently, the Stonewall Inn refused entry to a blind person and their service dog. The news didn’t surprise many LGBTQIA+ disabled people, as disheartening as that sounds, because we’re used to being left out of LGBTQIA+ spaces because of our disabilities. This happens when a queer bar is located up a narrow flight of stairs with no ramp or elevator. It happens when there’s an LGBTQIA+ slam poetry reading without an American Sign Language interpreter. It happens when there’s a march for our rights that doesn’t have another option to participate for people who can’t physically march or who need to sit and rest. Pride events are inaccessible to many people. These events often include police and law enforcement presence, making them unsafe for people of color and religious minorities. It can be expensive to attend Pride, even though parades might be free to the public, because you need transportation there, food while you’re out, and money to spend on the after-parties, which often take place at bars and nightclubs. “By being inaccessible, the community misses out on the beautiful diversity of all the members and it misses out on true equality because everybody is not being treated as equal,” says Karin Hitselberger, an activist and blogger in Washington, DC. 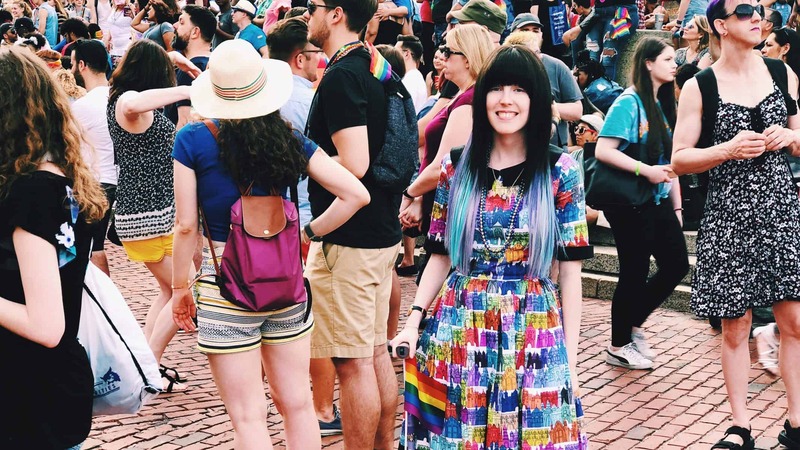 Emerson, a non-binary person with Ehlers-Danlos syndrome who is a wheelchair and rollator user, says they have run into numerous issues with Pride over the years. 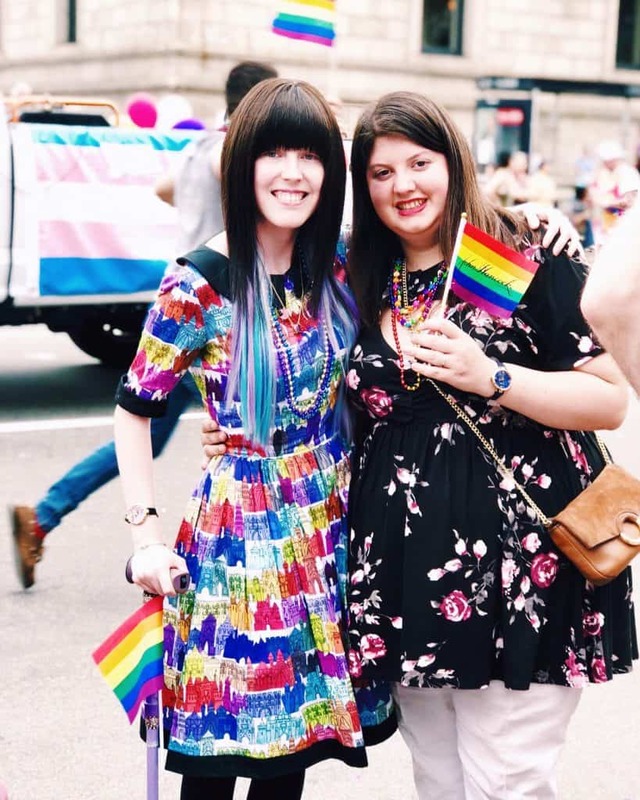 “I stopped going to Pride because there was nowhere to sit down to rest, it’s swelteringly hot, and all of the after-hours events are at bars that are largely inaccessible,” they say. Now that Emerson has a diagnosis and mobility aids, they’re nervous about attending Pride events using a wheelchair or rollator. “I worry about maneuvering on the sidewalks, which are rough and cracked in some areas and don’t always offer enough room for people in wheelchairs to get behind everyone set up in camping chairs and standing three-deep to watch the parade,” Emerson explains. As a cane user, I’m wary of Pride, too. I love the fanfare of a parade and crowds of people wearing rainbows and glitter, but it’s hard to move in a crowd like that—especially since I need to be able to sit down and rest in a chair with a supportive back after I’ve been standing for a while. It’s a challenge to even navigate the crowds because I have trouble with balance and spatial awareness, so I’m always bumping into people and losing my bearings. I’ve dressed my cane up so that it’s hard to miss (it’s lavender and adorned with glitter) so people will see me coming and give me space, but it’s such a packed event that isn’t always possible. I feel invisible in a lot of public LGBTQIA+ spaces like Pride, even though I have the privilege of being able to attend the celebration in Boston because of access to decent public transportation, the support of my friends and girlfriend (who help me carry heavy bags, or scope out seating), and financial independence to make choices like paying for a rideshare if I can’t walk long distances. This year’s Pride in Boston has a disability seating section, which is fantastic, but I’d also love for such events to go beyond basic access. I’d like to see LGBTQIA+ disabled people in leadership roles in the community, and being celebrated and honored, rather than being afterthoughts once most of the planning is finished. Much like the LGBTQIA+ community, the disability community has a long history of being radical and creating powerful change that impacts our larger society (universal healthcare, anyone?). “Disability justice has its own traditions of radical resistance and crawling up the Capitol Steps,” says Liz. “We’re creative, and have this amazing tradition of access hacks. We also have expertise on issues that affect the broader LGBTQIA+ community. For example, queer elders are aging and want to be able to retire but still maintain independence. If you included disabled people in your activism, maybe you could learn from the independent living movement, say, or our experiences with guardianship.” The LGBTQIA+ community is missing out on a lot of fun, hardworking, and talented people when they don’t include people with disabilities. And it leads to erasing a whole section of the queer community by simply keeping us out of mainstream celebrations. Making Pride truly accessible for disabled people means more than just finding ways to be ADA-compliant. It’s about including us from the beginning, and offering more than just one way to honor LGBTQIA+ history and culture. Wow. I learned so much just by reading this. I’m saddened, but I guess not surprised, that there is this issue with Pride events and accessibility. Could I share this blog post on my blog?